Should I take my rabbit with me on vacation? Each rabbit is different. Some don’t seem to mind travel and new places at all. However, the majority of rabbits find traveling and adjusting to a new environment to be very stressful. In most cases, you should not take your pet bunny with you on vacation. The experience of changing surroundings, the car ride, and the possibly noisy environment of the trip will not seem like a happy vacation to your rabbit, and may cause him or her to go off feed. This can lead to deadly digestive problems. Besides, you may be too busy to spend time with your rabbit while you are away! However, when the occasion does arise to transport rabbits in a vehicle, here are some travel tips that can help get them there and back safely. We should take a look at each of the animals we are taking to the show and make sure that they are in good health and condition. Travel stresses rabbits and can be deadly to a rabbit whose health is already compromised in some way. If you have a rabbit that is molting, consider whether you want to put additional stress on a rabbit that is dealing with a molt. Rabbits that are trying to regain condition may suffer a setback from the stress of traveling. Check to make sure does are not close to a kindling date before loading them up for a trip. Also check for DQ’s. There is no sense in traveling with a rabbit with a broken toe, missing toenail, broken tooth, broken tail, or other DQ that may have developed since the last trip. Although a rabbit can be transported in a pet taxi, it is not ideal for a long trip. And full-size cages will eat up your available space in no time. The best choice is a rabbit carrier. Carriers have wire bottoms with leak-proof trays underneath. These carriers meet the requirements of carrier shows (carrier shows are those in which your rabbits remain in their carriers rather than in coops; most shows are carrier shows). Carriers come in singles, doubles, triples, quads, and some even carry six rabbits. For Holland Lops, select carriers for small breeds, but not dwarfs – those work best for Netherland Dwarfs. Looking ahead to see what you need to take on the trip will help you be ready to load up on time. I may not need puppy training pads on a daily basis, but I put them in the bottom of my carriers when I travel. Don’t forget to put it on your shopping list if it’s not something you normally have around! If you don’t like puppy training pads, by the way, there are different types of litter you can use. I prefer a bird litter or pine cat litter. I find that they absorb odor the best and do not add a strong odor of their own. The bird litter is heavy and you should take that into consideration. You can also use pine shavings or line cages with newsprint. 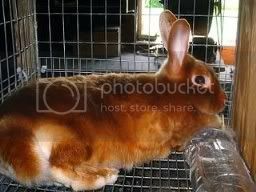 Special rabbit litters are great, but can get very expensive if you are transporting a large number of rabbits to a show. Rabbit appetites may suffer during a road trip. Be sure to bring your rabbits’ normal feed, even if the show is providing feed (milling may differ in different parts of the country–taking your own may not be practical for ARBA Convention). Also bring some of your rabbits’ favorite treats. Shredded wheat and juicy herbs like parsley or cilantro are good choices. Also pack hay. Even if you normally feed hay just every other day, it’s a good idea to give your rabbits a constant supply of hay while traveling since it helps them deal with stress. Some rabbit carriers come with built-in hay racks just for this purpose. I always bring water from home when I’m traveling. With all of the other stresses of traveling, rabbits do not need to be faced with the additional challenge of adapting to a different water supply. My rabbits are used to well water, for example, and might not do well with chlorinated water or water with different mineral levels in it. Speaking of water, using travel-size water bottles will make packing your carriers much more convenient. Travel sizes range from 4 to 8 oz. I prefer metal spring clips to attach my bottles to my cages. Pay a little extra for stainless steel spring clips–the others rust. I do not like the 5 oz. quick-loc type hugger bottles–the turtles (floating water level indicators) come out and the levers break off in the first trip or two. I’d love to see a sturdier model made, however. It’s a great idea. And I love the washerless lids. Even though I have an automatic watering system in my barn, I could not get my rabbits to adapt to their travel size water bottles with the same type fount on it. I’ve seen others use them with the hole in the cap considerably widened. Maybe that would help. I never use my Nivek travel bottles. Of course, if you are going to a show, you will need to bring lots of other things with you. Showing rabbits requires preparations of its own. To protect your vehicle from hay, fur, and misdirected urine, you may want to put down a tarp, carpet squares or another type of barrier between your bunnies and your car. Just make sure that your rabbits cannot pull that barrier into their cages and chew it up. Besides losing the protection, you may jeopardize your rabbits’ health. Make sure that your rabbits will get adequate ventilation and will be out of direct sunlight in the car. Be sure that rabbits are not placed directly in front of a heating vent. Rabbits have died on car trips from being blasted with hot air during the trip (check to be sure that the heater is not inadvertently turned on). Again, make sure that rabbits cannot pull items into their carriers to chew on them. Pack your carriers sideways. That is, make sure your rabbits are facing the sides of the vehicle. If you must brake suddenly, your rabbits’ bodies will be thrown against the wire – a much better choice than having teeth hitting wire. I picked up that tip from ARBA Judge Bill Rice. I had never thought about it before he mentioned it to an exhibitor whose rabbit had a broken tooth. It’s a simple precaution that just may prevent a problem. Ventilation is important on car trips with rabbits just as it is in your barn. I drive with my back windows open year round. For a special show rabbit or a beloved pet, you may want to consider a crate fan. Although it would not be practical get have crate fans for two dozen bunnies, using a single fan or two is an inexpensive way of keeping air flowing in a carrier. Rabbits should never travel in the trunk of a car. In warm or hot weather, they should not travel in the bed of a truck or in a trailer, unless air conditioned. Once you have decided that the space in your car is safe, you can stack carriers on top of each other, if needed. Use bungee cords to connect cages together so that they do not slide around, possibly injuring your bunnies. Make sure that you will be able to see to drive. You can bungee other items, such as your grooming table or your cart as well, so that items do not knock together. By packing carefully, I can easily fit 40 rabbits plus show supplies and my luggage into my mini-van. Of course you will want to check on your bunnies periodically during your trip. Make sure that the water bottles provide a continuous supply of water to your rabbits. Since they are smaller than normal, you may have to fill them more than once per day. You might try using a car ionizer to neutralize the odors in the air and make the trip more comfortable for the humans and healthier for your rabbits. When you stop for breaks and meals, make sure you always park in the shade, even on cool days, if it’s sunny. On warm days, leave the car running and the air conditioning on. Having two car keys comes in handy with this little trick. For short trips during the heat, I have frozen large cans of water and placed them in the empty compartments of a carrier to keep my bunnies cool. It is not likely to ever be too cold in the car for the bunnies. If it is safe enough for you to be out driving, it’s safe enough for the bunnies to stay in an unheated car. If your hotel allows it, take your bunnies inside for the night in warm weather. It is worth it to shop around and find those places that will allow your bunnies inside. Otherwise, make sure you don’t stop for the night until it is dark out and the temperature has dropped. Bunnies that stay in the car should remain ventilated. Just open the back windows a bit. Make sure you park in the shade so that the morning sun doesn’t stress or even jeopardize your bunnies before breakfast! If you are traveling to a show that allows it, you might want to take your bunnies to the show site for the night. Consider any security needs you might have for valuable bunnies. A small lock can help. When in doubt, keep your valuable stock with you.